ABSTRACT: The Phosphoria Formation and related rocks were deposited over an 8.9 m.y. interval beginning approximately 274.0Ma and ending approximately 265.1Ma. The Meade Peak Phosphatic Shale Member was deposited in southeastern Idaho and adjacent Wyoming over 5.4 m.y. from approximately 273.2 to 268.6 Ma. The Retort Phosphatic Shale Member was deposited in southwestern Montana and west-central Wyoming over 1.3 m.y. from approximately 267.4 to 266.1Ma. The base of the Roadian Stage of the Middle Permian occurs within the lower phosphate zone of the Meade Peak. The base of the Wordian Stage occurs within the upper phosphate zone of the Meade Peak. The presence of a cool-water brachiopod fauna, cool-water conodont faunas, and the absence of fusulinids throughout the Phosphoria basin indicate the presence of pervasive cool, upwelling waters. Acritarchs are intimately associated with phosphorites and phosphatic shales and may have been the primary organic producer to help drive phosphate production. 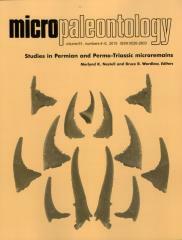 The gondolellid conodont fauna of the Phosphoria Formation links a geographic cline of Jinogondolella nankingensis from the Delaware basin, West Texas, to the Sverdrup basin, Canadian Arctic, and shows distinct differentiation in species distribution, as do other conodont groups, within the Phosphoria basin. Ten species and two subspecies of gondolellid conodonts are recognized from the Phosphoria Formation and related rocks that belong to Mesogondolella and Jinogondolella.